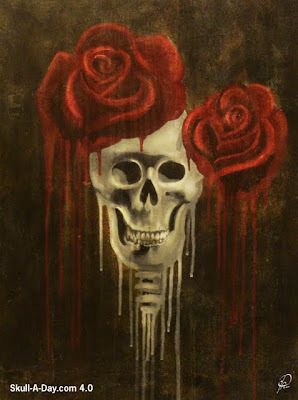 Toronto, Ontario, Canada is home to Paige Reynolds, a visual artist who tells us, "Most of my art is dark, surreal and macabre and I frequently use skulls in my artwork." Her mixed media designs consist of visual artwork, paintings, photography and visual effects. She's done a great job of filling today's post with some excellent images that are stunning and should not be missed by skull lovers everywhere. These are just 3 of the images Paige submitted and I must admit that I loved everything she sent us. 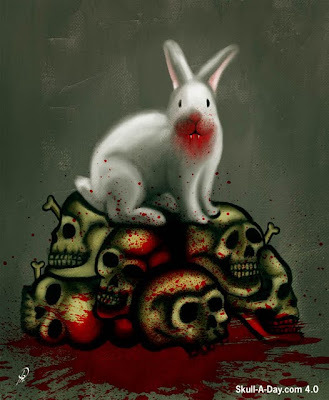 Her site is filled with more of these macabre images that are dark, ghastly, creepy, and most of all- AWESOME! I think the "Skull Card" is my favorite. The King Of Skulls seems like a character that could trump any Ace and would make a fitting groom for the Queen of the Dead. Thanks for keeping it dark and bloody, Paige. I love them all, but "Defrost" is my favorite. I love the melting. 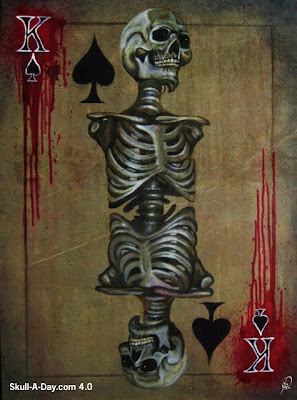 The skull card is my favorite- very creative!